The rugged and reliable KingQuad 500AXi Power Steering receives a few new changes that provides smoother acceleration, quicker throttle response, and a stronger feel in the mid-high RPM range. 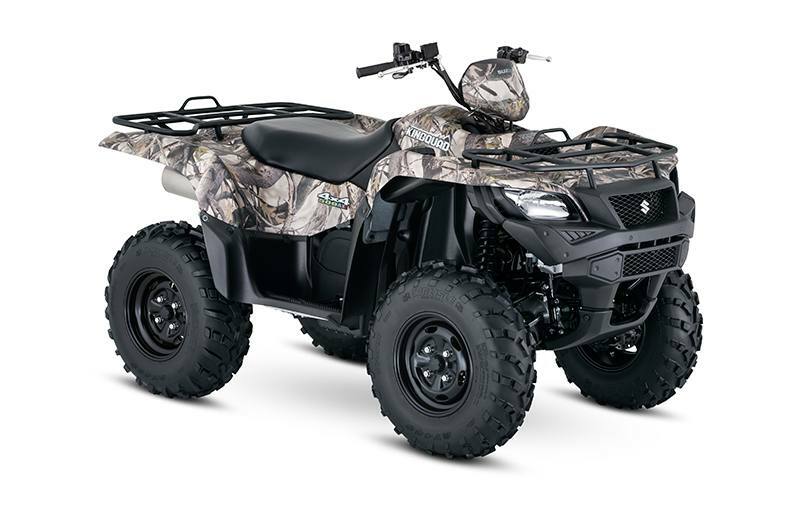 The KingQuad 500 AXi features a newly designed twin-spark cylinder head and modified cam profiles to improve both power output and fuel economy. The front end of the quad gets a newer aggressive stance while side panel change allows you to easily check your oil level without removing any body parts. Over three decades ago, Suzuki literally invented the 4-wheel ATV. The Original Suzuki LT-125 established Suzuki as the First On 4-Wheels. The Suzuki KingQuad 500AXi Power Steering carries on the tradition of performance that rules. Boasting the same advanced technology as the extraordinary KingQuad 750AXi, it's engineered to help you cut the work day down to size - or conquer the toughest trails. The KingQuad 500AXi Power Steering offers plenty of class-leading features and its fuel-injected 493cc engine gives it exceptional performance. Independent front and rear suspension. A QuadMatic™ CVT-type automatic transmission, locking front differential and a host of other impressive features place the KingQuad 500AXi Power Steering at the front of the pack. Advanced electric power steering system gives the KingQuad 500 AXi lighter steering and even more responsive handling than ever. Suzuki fuel injection system, featuring high-performance motorcycle technology, provides excellent throttle response, fuel efficiency and quick engine starts under all operating conditions. Newly designed Twin-Spark-Plug cylinder head delivers stronger feel at mid-to-high RPM Range. A powerful 493cc, SOHC, single-cylinder, liquid-cooled, four-stroke engine was designed for a wide powerband with strong top-end power. Its cylinder is canted forward for a lower center of gravity, reduced engine height and lower seat height. The engine also features a counterbalancer shaft for smooth operation. The KingQuad 500AXi has a compact 4-valve cylinder head with large intake valves and straight intake ports for increased cylinder charging efficiency. A sportbike-derived chain-and-gear camshaft drive system allows a short/narrow cylinder head design and reduced overall engine height. A lightweight aluminum cylinder bore is electro-plated with Suzuki's own race proven SCEM (Suzuki Composite Electrochemical Material) for improved heat transfer and tighter piston clearance. A high capacity aluminum radiator with large diameter cooling fan provides stable engine operating temperature. 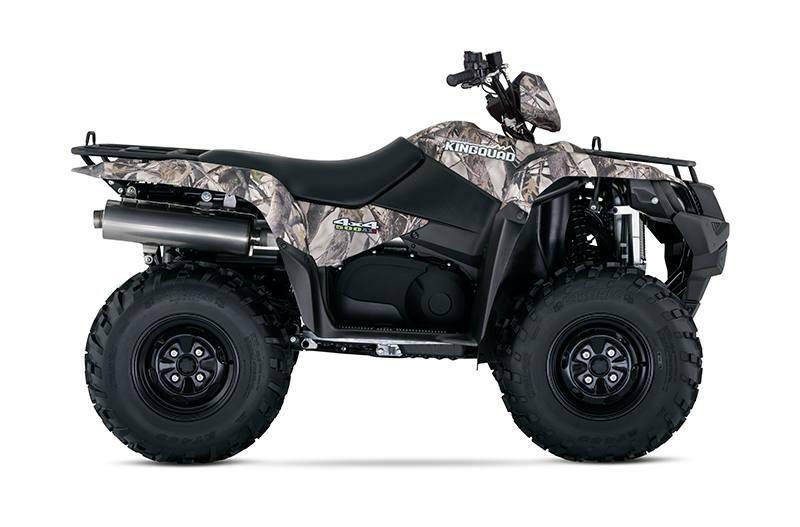 The KingQuad 500AXi comes with a QuadMatic™ CVT-type automatic transmission designed for maximum versatility and convenience with a fender-mounted gate-type shifter operation for high/low. Its advanced engine-braking system minimizes free-wheeling with the throttle off and helps control the vehicle during steep descents. A compact torque-sensing limited-slip front differential offers more powerful traction plus light steering effort. A differential-lock system provides serious four-wheel-drive traction. A convenient handlebar-mounted push-button controls allow the rider to easily select between 2WD, 4WD and differential-lock 4WD to get the right setting for any traction condition. An Override switch on the left handlebars can be used to override the normal speed limiter when stuck in the mud. Independent double A-arm front suspension (7.1 inches of wheel travel) includes large diameter shock absorbers with 5-way spring preload adjustment. Fully independent, A-arm/I-beam rear suspension with long suspension travel (7.9 inches of wheel travel), includes large diameter shock absorbers with 5-way spring preload adjustment and large diameter rear sway-bar. The KingQuad 500AXi has dual hydraulic front disc brakes. A sealed, multi-plate rear brake system, with a clutch-type design provides high durability, offers reduced unsprung weight, and is low-maintenance. 25-inch tires come mounted on heavy-duty steel wheels. Suzuki's innovative and exclusive T-shaped seat with tapered design for rider mobility, plus thick padding for support. A polyethylene skid plate provides front-to-rear under carriage protection with minimal resistance over rocks and rough terrain. Durable plastic guards protect the front and rear half shafts. A winch-ready chassis with flexible tube routing comes standard (for wiring from the winch mounting space to under the seat). Digital instrumentation includes LCD readouts for speedometer, odometer, twin tripmeters, hour meter, clock, fuel gauge, driving range position and drive mode. LED indicator lamps for high, low, neutral, reverse and drive—2WD/4WD and differential-locked 4WD. LED indicator lamps for fuel injection and engine temperature. The KingQuad 500AXi offers distinctively-styled 30W multi-reflector halogen headlights, and compact 5/21W tail light and brake light. A high output magneto generator system and large 18-amp maintenance-free battery provides extra power. The KingQuad 500AXi comes with a large 4.6 gallon fuel tank, positioned for a low center-of-gravity. It includes a vacuum-operated petcock, ratchet-style fuel cap and convenient bar-type fuel gauge. Two dry storages keep your personal belongings safe. A large 2.8 liter water resistant front storage compartment includes new easy-to-open/close screw-on cap located on the right-side front fender and a storage box located at the rear. The KingQuad 500AXi comes with rugged steel-tube racks with wrinkle paint finish for increased durability and scratch resistance.